Having returned from a holiday at sea, we thought you might enjoy a little “behind the scenes” look into some of what it takes to feed some 2,000 or more guests on board a luxury Five Star cruise ship at sea. 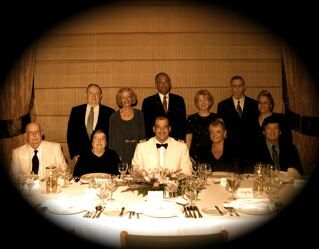 Original color photo was a gift courtesy of Celebrity Cruise Lines (decreased in size, antiqued, and blur edged vignette effects adjusted for this blog posting; I’m in the back row on the right as you look at the photo). For this example, we’ll focus on Caribbean cruises setting sail from San Juan for a 7 day cruise, with all food supplies coming on board in San Juan and later in St Thomas for the chefs and their staffs to then work with in order to create thousands of servings of delectable offerings from scratch. Meat is aged for 28 days before being delivered to the ships so that the chefs feel the texture is better as a result. When a ship travels to a port that might have access to fresh seafood, the executive chef can decide to make local purchases if desirable. It takes an enormous staff working 24/7 on various shifts to prepare all the many entrees and side dishes and desserts featured on a single, one week luxury cruise. An Executive Chef is in charge of the entire operation (all Galleys) which includes all staff involved in food preparation, overseeing some 250+ staff members that keep the main Galley running 24 hours a day, every day. To serve some 2,000+ guests and ~1,000 crew, there are approximately 9 Chefs de Cuisine and Sous Chefs managing the various kitchen areas and the staff of chefs under them, which includes one special diet kitchen area that handles all of the special diet requests onboard (one contacts the cruise line in advance when booking a cruise to place a special diet request; or if need be, once on board one contacts a maître d’hôtel to work out special diet details). It is estimated that the main Galley area (deck 3) in the belly of the ship has 16-17 staff for the Pastry Shop & Gelato prep; 15 for the Bread Bakery; 52 for the Main Galley prep; 11 for the Crew Galley Prep, and 19 for the Preparation Rooms including the Butchers and Fish Chefs. The Executive Chef reported he had a total of 135 Chefs on board and 22 Assistant Chefs on board each of the two, one week each back-to-back sailings we were on. On an “average” day (depending upon the actual guest and staff count on board), some 13,000 individual items are plated in the Galley areas (there are 3 Galleys on board). Dinner service is primarily at two seatings in the main dining rooms on decks 4 & 5 (not counting the specialty restaurants). Guest orders are taken from menu offerings by wait staff and then entered into a computerized system and the orders arrive in the Galley on deck 3. There, everything is plated up using photographs of how each plate should look prior to being covered with metal covers and loaded onto trays for the waiters to then take up an escalator to the main dining room floors on decks 4 & 5. Entrees are cooked a-la-minute when the order from the dining room is received. We were pleased that meats were indeed cooked to order and received pleasantly hot. Soups are now sent via carafes to arrive steaming hot (or chilled if a cold soup to arrive at the proper temperature) in the dining room levels. To see a couple of examples of the types of menu offerings, check out this beyond ships page or this one. The left side menu consists of always available “Classic Dinner Favorites” and then the right side menu rotates daily (the number of menus is tied to the number of days of the cruise up to say 21 days of potential menus, and when the ship is in a port with specialty fish, etc., may be altered based on fresh seafood availability at such a port as noted above). Guests can “mix and match” between the two sides of the menu each and every night. Recipes are available for staff to use when preparing the items. For example, at Cafe al Bacio, various finger sandwiches are served mid-day and these are available for on-site consumption at the cafe or to go. One we enjoyed was a simple prawn on avocado tartare with micro herbs served on a petite roll and I tracked down an authentic Celebrity Cruise Line’s chef’s version. Since the main sit down waiter service dining room is open only for breakfast and dinner, and one brunch per sailing (on a sea day), a buffet restaurant area on one upper deck of the ship (deck 10) serves guests varying breakfast options at posted times, lunch options, and then afternoon snack options, as well as dinner choice type selections, all in a very casual atmosphere. There are also areas serving fast food type choices that are open for longer time periods throughout the day (hamburger and hot dog grill, salad bar, pasta bar, pizza corner, and yogurt/ice cream stand). It never ceases to amaze me how popular pizza is, nor how popular the grill area is (since after all, guests can easily get those types of items at home and you might think they would venture to try other options while on vacation at sea). Room Service will have a much more limited menu, but available items can be delivered to your stateroom upon request using the interactive T.V. system. There is also a Spa Cafe on most ships to allow those who wish to try some lower fat choices (including some organic food items) the opportunity to do so for at least breakfast and lunch. Often times fresh entree items can be cooked a-la-minute to order, including tuna or salmon fillets, pork cutlets or chicken breasts. Fresh poached fruits, freshly made ficelle bread choices, lower fat desserts, etc., are all available there. Note that although a number of choices will be lower in fat, not all are and they may not be lower in sodium, so one still needs to be judicious in the choices one makes even while eating at the Spa Cafe. There are also a number of specialty restaurants onboard, each with some type of additional cover charge per person. I will cover those in another blog post.